1. Italy prepares for bank bailout: The world's oldest operating bank, Monte dei Paschi, is expected to ask the Italian government for a bailout Thursday. The bank warned this week that it is on track to run out of cash in about four months. It's been trying to convince private investors to give it €5 billion ($5.2 billion) for a turnaround plan, which would allow it to avoid a government rescue. But investors don't appear willing to part with enough cash to make it work. Monte dei Paschi's shares have crashed by about 87% since the start of the year. 2. GDP revision: The U.S. Bureau of Economic Analysis is releasing updated GDP data for the third quarter. The last release showed the economy grew at an annualized rate of 3.2%. Economists generally aren't expecting a shift in this figure. A strengthening U.S. economy led the Federal Reserve to raise interest rates earlier this month. 3. Market movers -- Nintendo, Nokia, Actelion: Shares in Nintendo (NTDOY) dropped again Thursday as investors worried that the company wasn't going to make much money from it's hyped-up game, Super Mario Run. Nintendo stock has plunged by more than 14% since the game's release last week. Shares in Nokia (NOK) are slumping after the Finnish firm announced it's suing Apple (AAPL) for patent infringement. The company said Apple used 32 of its patents without permission covering technologies such as software and video coding. Shares in Swiss biotechnology firm Actelion (ALIOY) are surging in European trading after the company announced it's back in exclusive takeover talks with Johnson & Johnson (JNJ). J&J recently ditched plans to buy the company, and Actelion began talks with another suitor. But now the pair have reunited. 4. Stock market overview: Global stock markets are sagging a bit on Thursday. 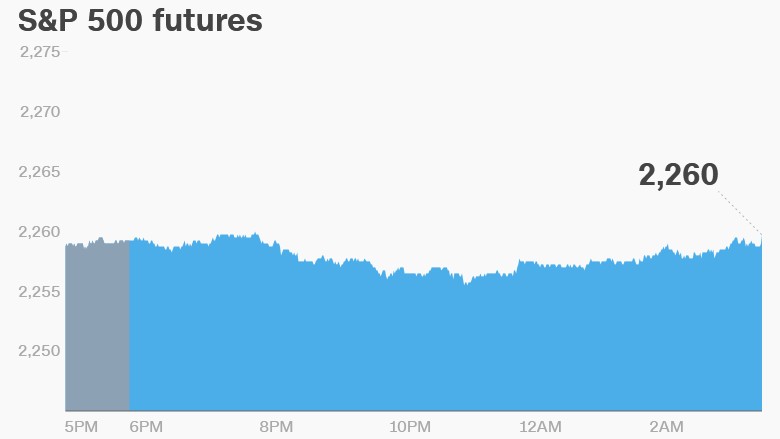 U.S. stock futures are inching down. European markets are mostly negative in early trading. Asian markets are closing out the day with some minor losses. Investors have recently grown excited about the Dow Jones industrial average hitting the 20,000 level. It's currently sitting at 19,942 and has been trading just below the 20,000 mark for a few days. 5. Earnings: Rite Aid (RAD) and ConAgra (CAG) are releasing earnings Thursday before the open, while Cintas (CTAS) plans to release results after the close.